The Seven Wonders is a passionate, contemporary response to Hobbes’ poem, De Mirabilibus Pecci: Being the Wonders of the Peak in Darbyshire, the first ‘guidebook’ to an area that Daniel Defoe described as ‘a houling wilderness’. The work on this site has been created through a collaborative process involving, currently, ten poets and an artist working in paint. Each individual work has a particular identity but, taken as a whole, The Seven Wonders offers a unique personal and historical meditation on landscape, filled with associations and references. The project is ongoing and will, we hope, develop and change shape over the course of the next few seasons. All of the poets involved have an interest in landscape and what has come to be known as ‘psychogeography’. They are James Caruth, Matthew Clegg, Angelina D’Roza, Mark Goodwin, Rob Hindle, Chris Jones, Helen Mort, Fay Musselwhite, Alistair Noon and Peter Riley. Previous collaborations involving these artists have included Cells, watercolour paintings by Paul Evans and poems by Chris Jones, exhibited at Cupola Contemporary Art, Sheffield, in 2008 (as part of After Nature) and Chalk, a painting and poem collaboration by Paul Evans and Matthew Clegg which explored associations with the chalk landscape at Flamborough Head and Bempton Cliffs. James Caruth, Angelina D’Roza, Mark Goodwin, Rob Hindle, Chris Jones and Fay Musselwhite have recently contributed to The Footing, an anthology with Longbarrow Press that explores our relationship to place through poems themed around the physical act of walking. Walking is one of our most direct and intimate ways of being in the natural landscape – and has been part of the creative practice of many writers from Basho to Wordsworth and in the recent work of Robert MacFarlane. 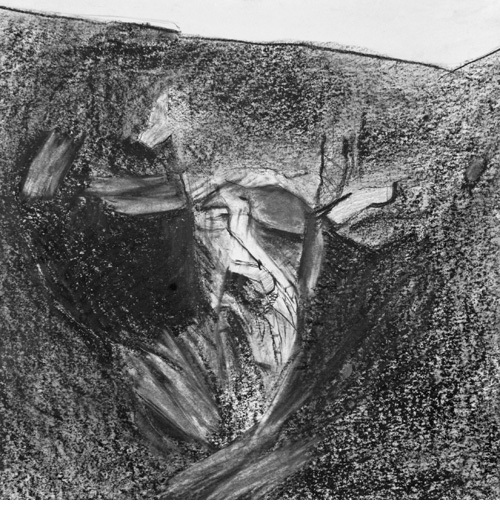 A variety of methods have been involved in this collaborative process: in some cases the writing has evolved out of the poets’ direct responses to the landscape, in others the response has been mediated through experience of the paintings as ‘work in progress’ or through historical research. A number of the paintings respond as much to the poetry and the ideas within the texts as they do to the landscape features themselves. In his essay, ‘Writing about Landscape’, Ted Hughes reminds us that ‘beauty spots’ and ‘wild places’ have a capacity to refresh us. ‘It is only there that the ancient instincts and feelings in which most of out body lives can feel at home and on their own ground. It is almost as though these places were generators where we recharge our run down batteries.’ We feel this is a part of what is promised by the idea of a ‘natural wonder’, and we have no doubt that it is a promise important to many people all over the world. It is a commonplace now to point out how the style and pace of modern life has removed human beings from crucial relationships with the physical environment, and the ecology of the planet. As Robert MacFarlane writes in The Wild Places: ‘…on almost every front, we have begun turning away from a felt relationship with the natural world… In so many ways there has been a prising away of life from place, an abstraction of experience into different kinds of touchlessness.’ We believe one of the responsibilities of poetry and art is to explore ways of redressing imbalances within the psyche. We also believe that many people have a deep desire to redress this imbalance. The Seven Wonders is our attempt to explore and celebrate our ‘felt relationship with the natural world’ through art focusing on the most visited national park in the UK. The Seven Wonders of the Peak were first described by the popular Tudor poet Michael Drayton in the third edition of his Poly-olbion or a Chorographical Description of Tracts, Rivers, Mountaines, Forests, and other Parts of this Renowned Isle of Great Britane, published in 1622. Then, in 1636, Thomas Hobbes wrote the poem De Mirabilibus Pecci: Being the Wonders of the Peak in Darbyshire. This was translated by Charles Cotton (co-author of The Compleat Angler) in 1681 and was published to great acclaim. Hobbes’ list comprised the following: Chatsworth House, Peak Cavern, Mam Tor, Eldon Hole, St. Anne’s Well, Poole’s Cavern, The Ebbing & Flowing Well, Peveril Castle and Thimble Hall. Apart from Peak Cavern and Mam Tor, our list differs from that of Hobbes in a way that we hope reflects the sense of wonder and sensibilities of today’s viewer or reader. Our list includes nothing man-made, only the natural wonders of Peak Cavern, Mam Tor, Kinder Downfall, Thor’s Cave, Hen Cloud, Stanage Edge, Chee Dale and The Burbage Valley. It is, of course, a subjective choice. We very much welcome your thoughts on our choice of wonders. Perhaps (like Daniel Defoe) you perceive this list to be one of ‘wonderless wonders’, or perhaps, like us, you see these massive natural forms as a means not only to calm the mind and take leisure, but also as arenas in which powerful geological forces, operating through deep time, are revealed. Restating an awareness of this ‘sublime’ perspective is timely given our current sensitivity to the effect that we are having on our environment.